This was a fun photo session [as I call them]! 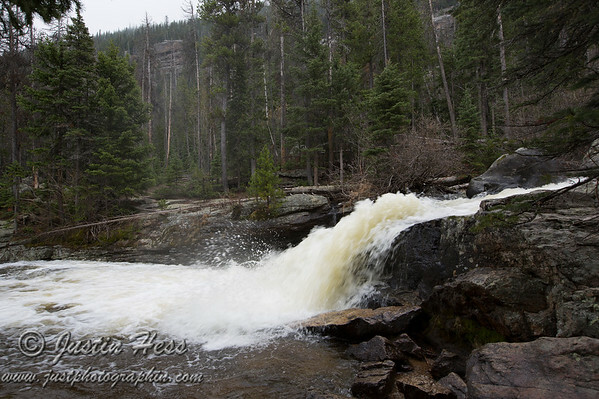 I was attempting some “silky” water photos during a walk along the North St. Vrain River in Wild Basin – Rocky Mountain National Park, Colorado. In order to show how shutter speeds relate to stopping action, I took several photos with fast shutter speeds. I also took several photos with a slow shutter speed which results in a longer exposure time. The longer exposure time allows the water to flow through the frame and creates the “silky” water look! A middle of the road shutter speed will partially stop action and partially let action move. This is what is going on in the photo above. The shutter speed was not quite long enough to get “silky” water, yet it was long enough to show motion. I will be attempting a few more of these later on. I have a few more water falls to hike to that I can attempt the “silky” water look with. It is not possible to shoot such a slow shutter speed hand held, which means a tripod is necessary to have strapped to the backpack!